PPL offers various auction formats and use the method best suited to reach the right audiences for your assets, according to your timeline, based on your unique needs. Live auctions are exciting because they allow interested buyers to physically preview the assets on site in a high energy environment created by a professional auctioneer. The webcast brings auction floor dynamism to remote bidders, and allows potential buyers to bid from wherever they are. Bids are submitted on site and online simultaneously. As opposed to a live auction, a timed online auction allows remote clients to bid on items within a certain date range, and has a defined start and end time. The dates are set according to your needs and our knowledge of industry buying habits. All bids are submitted online. PPL Group develops customized marketing plans that successfully promote our client’s assets for sale to the right buyers, at the right time and through the right channels. Our team is able to provide clients with this type of targeted approach due to our experience in understanding the buying motives and channel preferences of the buyer audience. 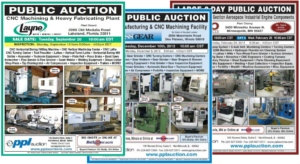 We create a full-color, multi-page auction brochure that generates buyer excitement about the sale. Successful bidders have provided extensive feedback to us indicating that they prefer to receive a full-color, printed brochure. We know this sounds old-fashioned. But we also know that this is one of the most effective channels for ensuring strong buyer participation. Our team will pull from multiple databases of thousands of buyers from a variety of industries. We send professionally formatted custom e-blasts to thousands of suitable buyers based on industry-specific SIC Codes and geographic locations. These e-blasts will include links to sources of more detailed information that will enable buyers to make informed decisions. We showcase the sale on our website, increasing visibility and promotional value. From the website, potential buyers will be able to access the sale details, auction brochure, catalog, and view photos of the inventory. Prior to the sale, we will strategically place custom advertisements in specific trade publications and newspapers that have historically reached the greatest number of qualified buyers.